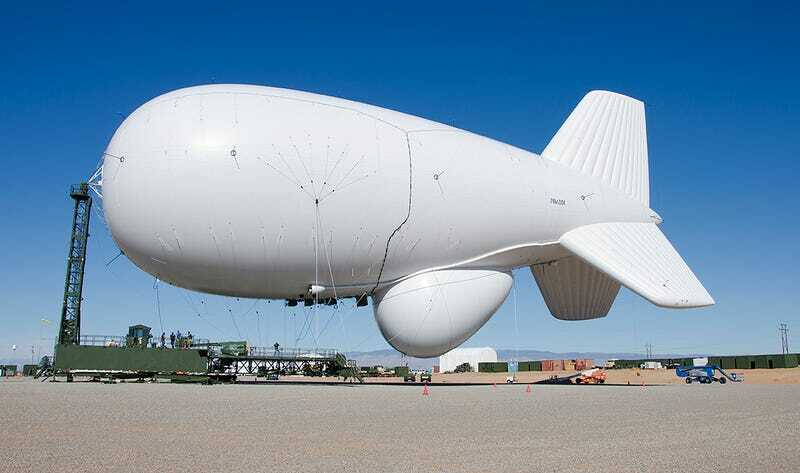 One of the two part radar wielding aerostat systems known as Joint Land Attack Cruise Missile Defense Elevated Netted Sensor System, or JLENS, has broken free from its mooring at Aberdeen Proving Ground and is floating uncontrolled over Pennsylvania. F-16 fighters have been scrambled to shadow the blimp-like craft. Obviously, this is not good news for the JLENS, which many have called a “zombie defense program.” A fairly recent LA Times expose eviscerated JLENS and the multi-billion dollar system did not detect a low-flying autogyro over capital last April. Now, with one of the hugely expensive JLENS aerostats roaming loose, the zombie defense program moniker really hits home, and the damage may not only be to the troubled programs reputation alone. Literally tons of sensors are installed on the helium filled aerostat host, which means it could do some pretty serious damage if it were to come down over a populated area. It is also trailing about a mile long umbilical tethering cable which could catch onto things on the ground if it were to descend. Unfortunately, the chances are that this thing is going to climb quite high before doing that. Shooting it down is not as easy as it sounds, as the F-16’s 20mm cannon rounds will end up falling to the ground somewhere. Considering there are multiple helium compartments in the aerostat, multiple hits in multiple areas may be necessary to bring it down in the near term. As such, an attempt to down the craft will most likely only be executed over very sparsely populated areas or over water. Update 11:51AM PST- JLENS is roaming free at around 16,000 feet apparently. Update 12:26PM PST- JLENS still on the loose but an official from the government told CNN that he believes it has a remote deflate capability. I cannot confirm this. Also it is likely that JLENS also carries some sort of WAAS capability.